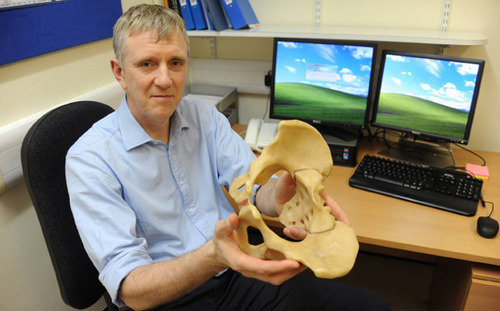 Craig Gerrand, consultant orthopaedic surgeon at Newcastle upon Tyne Hospitals NHS Foundation Trust, used 3D printing to create a pelvis – the first of its kind – for a patient who had lost his to cancer. The man, a retired professional in his sixties, had been diagnosed with a rare bone tumour called chondrosarcoma. Standard implants, made by hand, do not always fit well – and in this case, so much bone needed removing that nothing would be left to which such an implant could be attached, he says. But without a reconstruction, the patient’s leg would be left “hanging”, unattached to the spine, and shorter than the other. Meticulous planning was needed if the operation was to have a chance of success. The first step was to fuse CT and MRI scans of the pelvis to calculate precisely how much bone would be removed, and the dimensions of the space that would be left behind. The data were used by a British company Stanmore Implants, to 3D-print a bespoke model of a half-pelvis, with exactly the same shape and dimensions as the bone lost by the patient. The 3D process, also called additive layer manufacturing, involves gradually building a three-dimensional shape by laying down successive, fine layers of titanium powder, fused together by laser. The 12-hour operation was carried out using surgical navigation technology, in which images of the pelvis are uploaded on to a computer to create a model on the screen. “It’s quite easy with a complex organ such as the pelvis to get lost and take too much or too little bone. Using surgical navigation technology means you can cut the bone exactly where you planned to cut,” says Mr Gerrand. The next stage was to insert the titanium pelvis, which fitted perfectly. It was covered by a mineral into which the remaining bone cells could grow. This procedure was followed by a standard hip replacement, which fitted seamlessly into the titanium socket. Just over three years later, Mr Gerrand’s patient is able to walk, albeit with a stick – and is still very happy with his 3D-printed half-pelvis. Mr Gerrand welcomes the debate sparked by Lord Saatchi’s proposed Medical Innovation Bill, which would encourage doctors to innovate by providing them with a legal framework whereby they could try out unproven medical devices or treatments such as this. Innovation is desperately needed in the development of new treatments for bone cancer, an area where there have been no improvements in survival – currently about 60 per cent – for 30 years.